Frame NOT included. Vowing to serve his country any way he could, Mr. Wiskers took the super soldier serum to become America's one-cat army. 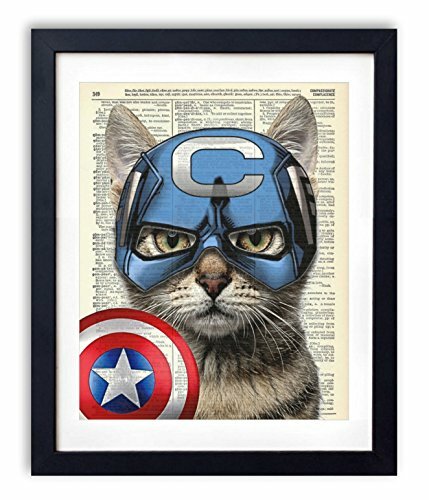 Fighting for the red, white and blue for over 60 years, Captain Cat America is the living, breathing symbol of freedom and liberty. Each design is printed on an authentic antique dictionary page from the early to mid-1900's. The pages that are used for each print are random pages from a vintage dictionary. Each page has a great antique look and feel. You will receive the exact image shown however the dictionary pages that are used will vary. This makes each print a one of a kind, as no two pages will be exactly the same. Each print measures 8x10 inches unless otherwise noted. Colors may vary slightly from the image shown. The prints DO NOT come framed, but will fit any standard 8x10 frame or any larger frame with an 8x10 matte. Our prints look amazing framed and displayed in any room of your home. They also make great one of a kind gifts! Frame Is NOT Included and is for presentation purposes only.